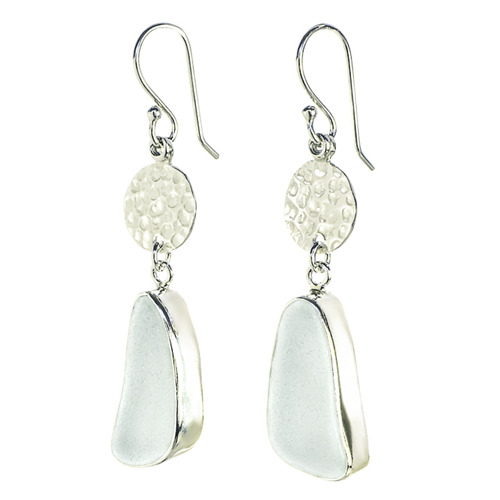 Jewelry featuring natural, unaltered sea glass gems. Formed from bits of shipwrecks & bottles, tumbled naturally by the salty ocean surf. “Beach memories forever". An endless summer filled with sand castles, shoreline strolls & sounds of the waves. Stocking the finest galleries, boutiques & museum stores. FREE Expedited Shipping & Insurance for orders written at the show! On February 16th, 2019 artist and designer Christine Gable Epstein debuts her newest line of sterling silver and sea glass jewelry in the juried Handmade Jewelry section of American Handcrafted™ Philadelphia. American Handcrafted™ is a juried marketplace showcasing artists from the contemporary, design-driven maker movement at the Philadelphia Convention Center in Pennsylvania. Trained at the School of Visual Arts in New York City, Christine’s casually elegant designs combine sterling silver with sea glass—recycled glass “gemstones” naturally formed from discarded glass objects that have been tumbled and shaped by the ebb and flow of the sea. While exploring the beaches of Puerto Rico in 2006, Christine discovered sea glass—pieces of yesteryear’s bottles, tableware and other glass objects worn smooth by the natural action of the ocean. “I hadn't ever seen sea glass before, and thought it had the most alluring combination of texture, shape and color." Hunting for sea glass became an obsession, propelling Christine and her family to overturn their lives and move to the pastoral coast of western Puerto Rico. 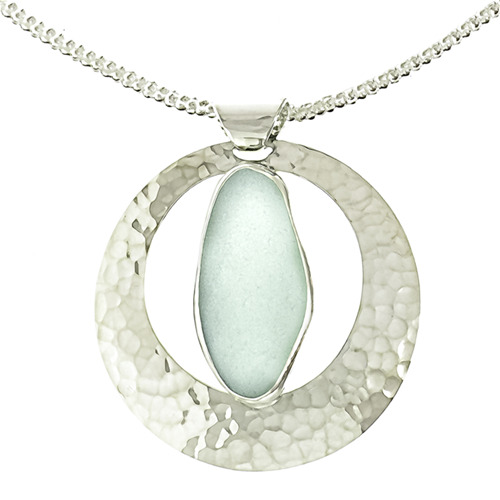 Fueled by a passion for the sea and its protection, Oceano Sea Glass Jewelry was born. This eco-friendly jewelry is retailed at select hotels, museums and boutiques throughout the United States, Canada and Caribbean islands. Celestial inspiration is the light reflecting along the curve of the pendant. Embracing a statement-sized piece of natural sea glass. .925 sterling silver with natural, unaltered sea glass. 1 3/4" Diameter. Taking a cue from our most revered lunar orb, the “Luna” collection combines natural beauty and drama. Organic shapes achieve a sinuous, feminine feel. In celestial shades of Soft Green/Blue. 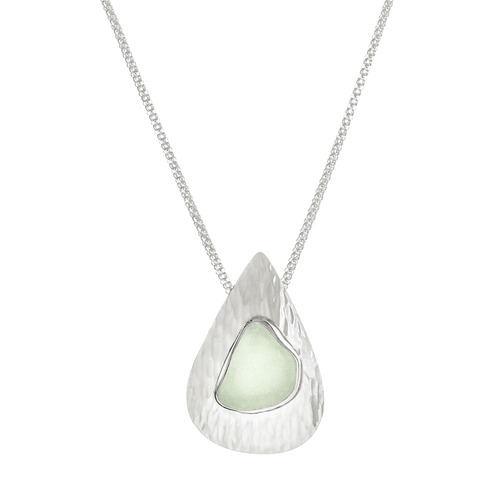 Formed and fabricated in .925 sterling with natural, unaltered sea glass. Fits sizes 6 1/2" to 8"
Twinkling like stars in the night sky. .925 Sterling silver. 1 1/2" long. French hook. By-pass band fits sizes 6.5 -7.5 Adjustable. 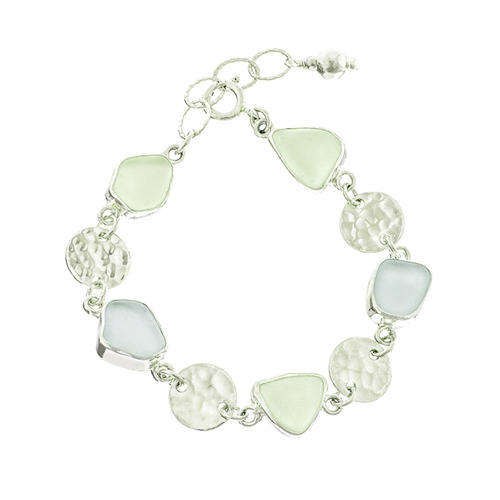 Shimmering texture and authentic sea glass mix to create a rustic elegance. Size Medium - 2 1/3'' diameter fits most. An awe-inspiring movement of silvery water spilling, rushing, roaring. The senses enveloped by its movement and energy. Rivulet lines etched deeply into solid rock. A pattern expressed of grace & force. Sterling silver hand-forged & fabricated to evoke the raw spirit of a tumbling stream. 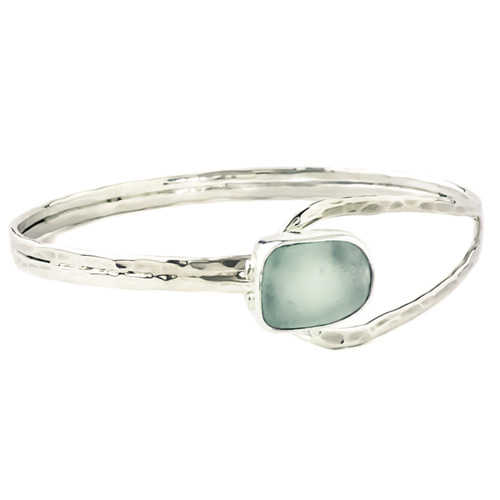 Accented with natural, ocean-found Soft Green-Blue sea glass & Australian Milky Opal. Opal is formed as water moves through the earth, settling into crevices forged by fossils. Over a 100 million years ago, a vast inland sea stretched over Australia brimming with sealife and prehistoric creatures. The water dried up long before humans and the ocean’s gradual retreat generated the perfect conditions for 'opalization' - leaving high-quality milky opals behind. It's said that Opals combine the energy of both Earth & Water in perfect proportion.